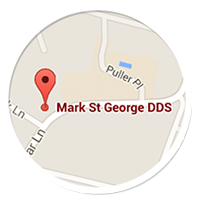 "Compared to the more-corporate, high-rise-suited Dentists, Mark St. George has three recommendable advantages: 1) works out of his house; 2) experienced & up-to-date; & 3) no plethora of Hygenists between him & your teeth. Mark takes the time to examine AND clean your teeth. You don't feel the bum-rush of the 6th Floor Bethesda, Rockville & DC dentists. Imagine: he spends TWICE the time working your teeth vs. the more financially pressured dental practice. Oodles of neighbors recommended Mark 8 years ago for good reason!" "My family has been seeing Dr. St. George for about four years. He's professional , knowledgable, and accommodating. I sent a text to Mark about my last emergency, he saw me immediately, he's efficient and does perfect work! The office is charming, the support staff is welcoming, there's easy free parking, and it"s convenient to the beltway."